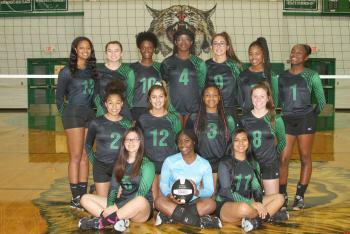 Congratulations to the Hempstead Ladycats who received all-district honors for the 2018 volleyball season. The Ladycats had a great season and finished the year third in district and Bi-district finalists. Dereishia Davis, a senior at Hempstead High School, was selected as the District MVP this year for District 23-AAA. Keyonna Harris, Brooke Hollan, and Katelyn Howard were selected to the Second Team All-District, while Leah Dozier-Hernandez, Jakayla Thomas and Maria Trujillo were named Honorable Mention players this year. Seven varsity players received Academic All-District honors. Academic honors went to Brooke Hollan, Meritzia Gomez, Caren Gonzales, Leah Dozier-Hernandez, Katelyn Howard, Ayeshia Smith and Maria Trujillo. Academic All-District honors are awarded to those athletes who maintain at least a 90 average during the entire volleyball season. Congratulations to these Ladycats for a job well done! These young ladies are setting a great example for fellow student athletes that academics come first at Hempstead ISD.